I feel slightly less pathetic today because we finally got our Christmas tree put away. 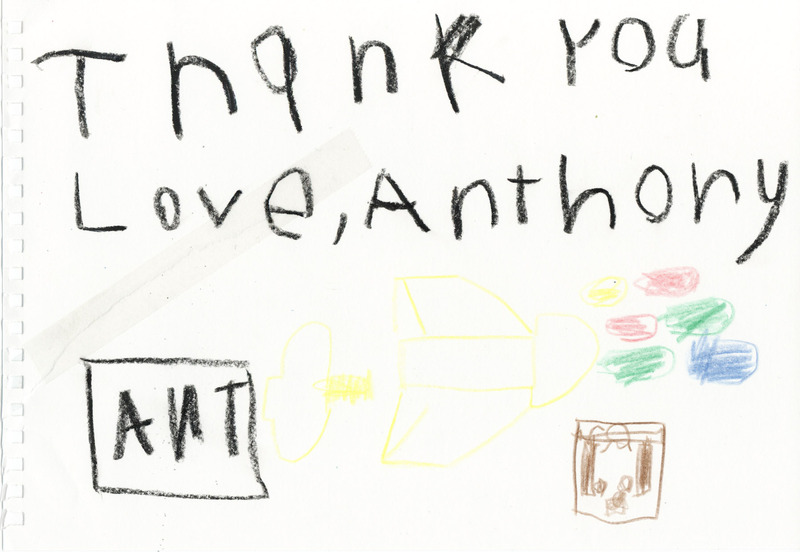 Also helping is that last week I finally got around to sending the “thank you” notes Anthony wrote for his presents. 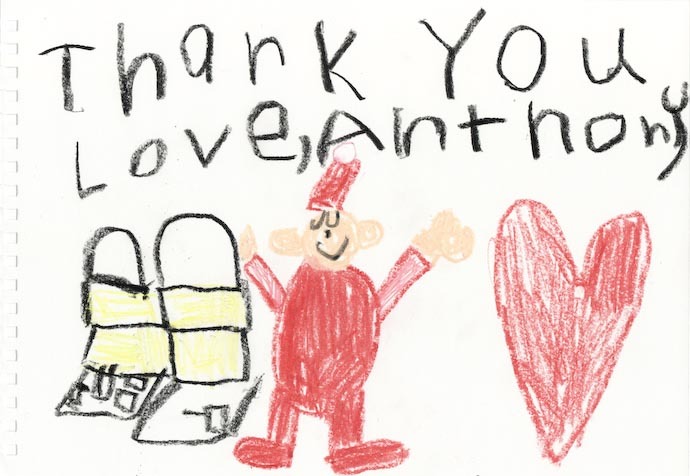 In preparing for Anthony to write them, I wrote “Thank you / Love, Anthony” on a separate piece of paper, then suggested that after copying it, he fill the rest of the paper with whatever he wanted in order to express his thanks for the gifts, or his love, or whatever he wanted. When I returned, these are the notes he had written. In the note for Santa, he drew a picture of the twin tower train station he received, a picture of Santa, and a big heart. Here, he drew some of the gifts from my brother and his wife: an “Anthony” bicycle license plate, an airplane toy, a bag of those capsules that puff and expand to a train-shaped sponge when they get wet, and a book that he really enjoys that arrived in the same package, from Aunt Lizzie. This note includes drawings of Grandma and Grandpa (with extreme artistic license for the hair, my mom being blond and my dad being a distinguished gray in the few places he's still got hair :-)), the helicopter thingy he got from them, its box, a heart, and a picture of himself saying how much he loves them. I think it's amazing how he came up with a way to indicate in the drawing speech coming from his own mouth. 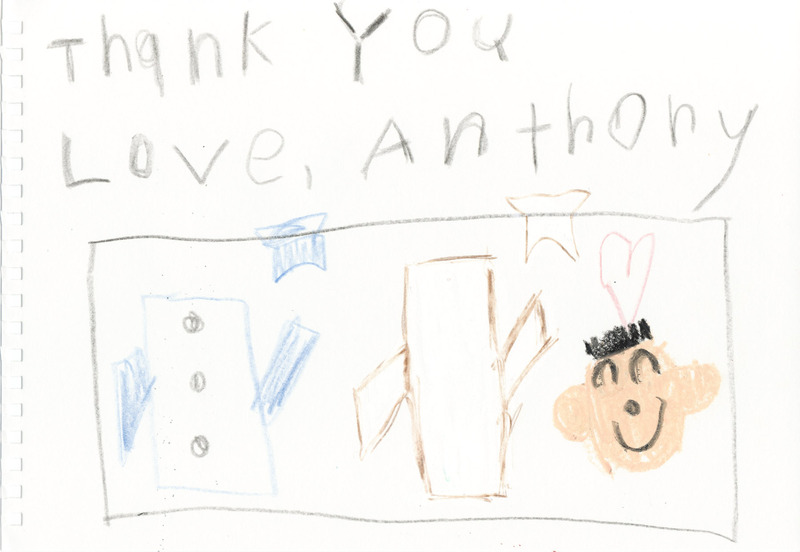 This note features the police uniform and chef outfit he received from my sister and her husband, along with their respective hats. 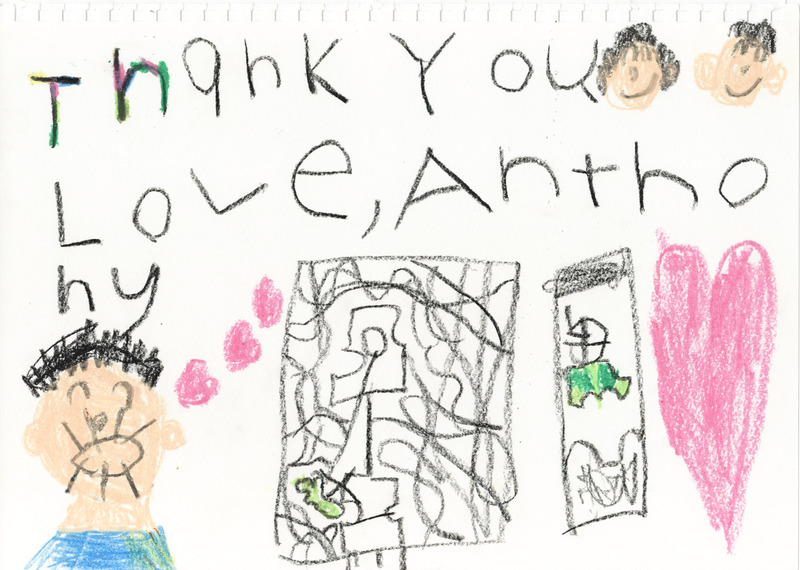 Anthony also added a picture of himself, and a heart. This one for my brother and his wife sports some of the Curious George stickers he received from them, along with a drawing of some of the sticker sheets and of some more of those “expand when they get wet” capsules (these for animals) he likes so much. I was watching as he drew this one, and thought he'd drawn another picture of himself, but no, this was Uncle Alan, which was soon joined by a visage of Aunt Natalie. He wanted to label them, so I wrote the names on a separate paper for him to copy. At right, under the big heart, he wrote his name in English, then a copied “In Japanese” with an arrow leading to his name in Japanese (backwards, perhaps because he was continuing in the direction of the arrow?). These are really wonderful drawings. 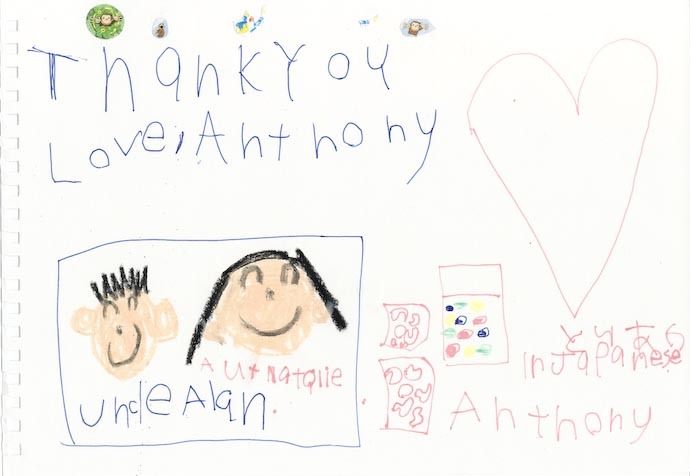 It’s so important to teach children how to write thank you notes, not just as a matter of etiquette, but to help them learn how to feel and show gratitude, and visual thank you notes like this mean so much to both the sender and the recipient!